I've realized recently that I have a strangely shaped index finger. In all of my photos, it looks like I have a really bad acrylic nail that's pointing the wrong direction -- I promise this isn't the case. Anyway, today's mani is a two-part inspiration. I just picked up the new OPI Euro Centrale collection, so I wanted to try out some sort of mani that used my favorite shades (swatches to come). 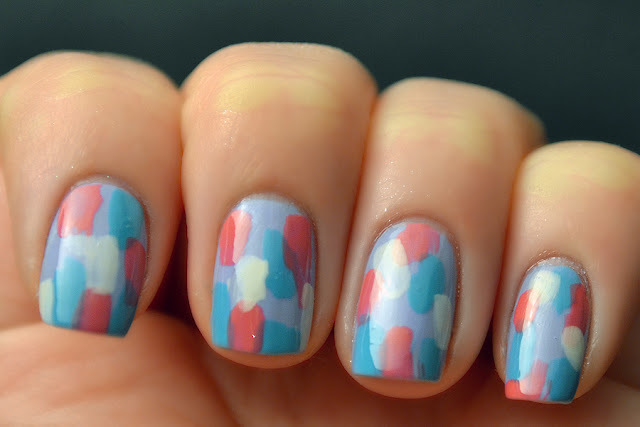 I looked back on the blog and found this old Easter mani of Wendy's from last year. For my base, I started with two coats of OPI You're Such a Budapest, a light lavender creme. Using three other Euro Centrale colors, Suzi's Hungary again (the coral pink), My Vampire is Buff (beige) and Can't Find My Czechbook (aqua), I painted random blobs all over the nail. I wanted to add my own twist to Wendy's mani, so I dug up my China Glaze Black Mesh Crackle polish. Before I apply any kind of shatter or crackle polish, I always, always put a layer of top coat to seal in the base colors. If you don't do this, you run the risk of the crackle applying unevenly. 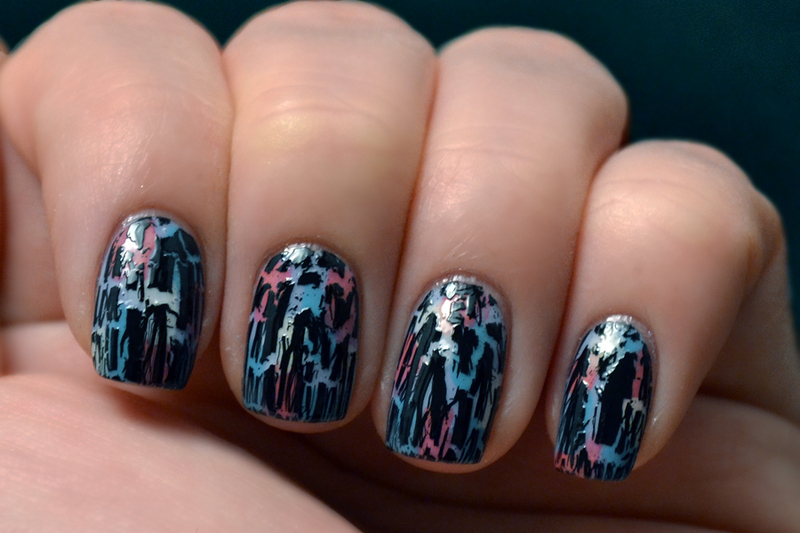 Every time I've forgotten to use top coat, the crackle goes on very streaky. I was actually inspired to add the black crackle by a lavender, beige and black sundress that I bought a few years ago at Macy's in Chicago with the same pattern -- it was miserably hot and even my shorts and T-shirt were too heavy. I think that's why I love these nails so much ... they remind me of cool, breezy relief on a hot summer day!